How to change a tire? It’s easier than you think. Promise! Note: Before tackling how to change a tire, read the instructions in your owner’s manual. Change the tire in a place well away from traffic, and when the car is jacked up, keep your body parts out from under it. A car falling on your tootsies can really ruin your day! Some cars come with tire repair kits (consisting of aerosol tire sealant and a compressor) instead of a spare tire. If this is the case, you won’t need to remove the flat tire from the car. Follow the instructions in the manual to pump up your flat tire. 1. Park your car on a flat surface, well away from traffic. Never, ever, ever change a tire on an incline or in a place where passing vehicles might hit you or the car. 2. Put the car in Park (automatic) or reverse (manual) and set the parking brake firmly. Put on your work gloves to keep your hands clean. 4. Take out the spare tire, jack and wrench (they should all be in roughly the same spot). Most vehicles store the spare under the trunk floor, but some trucks, SUVs and vans sling them under the bodywork. If this is the case, you’ll probably have to turn some sort of a bolt to lower the spare. Your owners manual will tell you how to change a tire on your particular vehicle. 6. Following the instructions in the owner’s manual, put the jack in place. Make sure it contacts the bottom of the car exactly where the owner’s manual says; otherwise you can damage the car’s body and you run a greater risk of the car falling off the jack. Jack the car up just high enough to lift the flat tire off the ground. 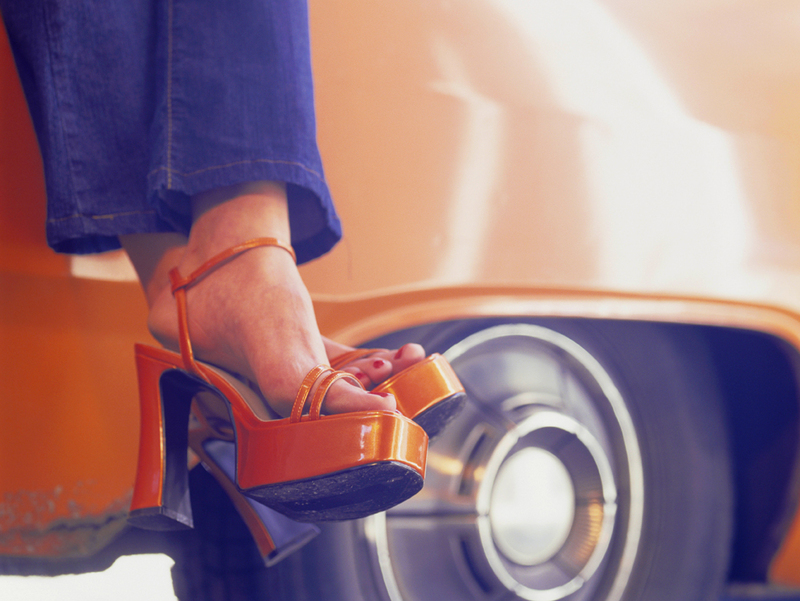 Don’t put your feet, hands, legs, or any other body part anywhere under the car – you don’t want them to get squished if the car comes off the jack. 7. Remove the lug nuts completely and put them someplace they won’t get lost. 8. Pull the wheel straight off the car. You may have to rock it back and forth. Be careful – it’s heavy! Most wheel-and-tire combos weigh between 25 and 40 pounds. 9. Optional: If your car’s spare is stored inside the car, you can put the flat tire and wheel into a garbage bag to keep the inside of the car and your clothes clean. If your vehicle slings its spare under the body work, there’s no rule that says you have to put the flat tire in its place; you can toss it into the trunk, but be sure to crank up the cable mechanism that normally holds the spare in place. 10. Stand the spare tire upright and roll it into place. Rotate the wheel so that the holes line up with the lugs (the metal posts that the wheels bolt onto). Use the jack to raise or lower the car to get everything to line up. 11. Slide the spare tire onto the lugs. We like to rotate the wheel so the holes line up with the lugs, slide the wheel on the top-most lug, raise the car slightly with the jack (just enough to lift the new wheel off the ground), and then push the wheel into place. 12. Screw on the lug nuts and finger-tighten them. Be sure the wheel is pushed all the way onto the lugs. 13. Now it’s time to tighten the lug nuts using the wrench. Tighten one nut, then tighten the one directly opposite. (If your car has five lug nuts, you’ll be working in a star pattern.) Use this cross-pattern to tighten all of the lug nuts. Vroomie tip: If the wheel rotates when you tighten the lug nuts, you can ask an assistant to step on the brake pedal. If not, do the best you can. 14. Use the jack to gently lower the car to the ground. Put the jack back in its hidey-hole, but don’t put the lug wrench away just yet. 15. Tighten the nuts again, using the same cross-pattern. Get those lug nuts as tight as you can! 16. Remove the wheel chocks. 17. Pause for a moment to bask in your awesomeness, you tire-changing Vroomie! 18. Drive the car about ten miles, then re-tighten the lug-nuts one more time, using the cross-pattern. 19. Some light-weight temporary spare tires have a speed limit (usually around 55 MPH). Take it seriously. Remember that your car may not ride or handle as well with the spare in place, so drive carefully. 20. Get the flat tire repaired or replaced as soon as possible. If the puncture is in the tread (the part of the tire that contacts the road), most tire shops will repair it (though most new-car dealerships won’t; they’ll try to sell you a new tire). If the damage is to the sidewall (the vertical part of the tire), repairs aren’t possible. Some tires have to be replaced in pairs, so don’t be surprised if the tire dealer tells you to buy two. Ask the tire repairfolk to store your spare, jack and lug-nut wrench in their original places so you’ll know where to find them if you have another flat. 21. Brag to all your friends who will stare at you with wonder! I like the tip about making sure that you don’t lose the lug nuts while changing the tire. I have done that before, and it is such a pain! I haven’t had a flat for a while, but I want to be prepared for it, so I just wanted to check up on how to change a tire correctly. Thanks for explaining everything so clearly! Getting tires at a tire store could be very beneficial. I like your tips for changing a tire yourself. Following good techniques for changing your car tires sounds like a good way to keep your car driving ready. It is interesting for me to learn a little bit about how to fix a popped tire. My car got a flat today and I was not sure how to fix it. Now I know if I follow these instructions I will be able to do the best auto repair for it. This is great, but what about the strength factor? I know how, but never seem to be strong enough to loosen the lug nuts! I’ve walked men through doing it, and it worked, but I can’t seem to do it myself. Thank you so much for your tips. I have been wanting to impress my boyfriend for a long time and this is what is going to help me do it! I don’t think he can himself so this is going to be awesome to show off. He will be so impressed all thanks to you! Nice breakdown, but images would help a ton. I actually made an infographic that demonstrates these steps pretty clearly. Feel free to check it out. Knowing this steps on how to change car tires is a great information for every car owners. It is a must that you are knowledgeable of this in case you experience a flat tire on the road. This is highly beneficial on women car owners on how to perform the tire change properly.